This thin, bug-like drone is an excellent choice for flight experts and filmmakers. Its incredible vertical range camera captures 4K UHD films and 21MP photos, plus sports 2.8x lossless zoom. Its lightweight, slim frame won’t take up much room in your bag. But, the lack of obstacle avoidance makes it difficult to recommend over DJI for newbies. When we decided to compare the DJI Mavic Air and Parrot Anafi to see which drone won out in raw specs, we were impressed to see how well Anafi stacked up to the best drone available on paper. So, we were excited to finally test the Anafi's mettle ourselves and see whether the drone would soar to meet expectations or fold under the pressure. After a few tests in the field, we're not certain about Parrot Anafi as a choice for drone newcomers. But, long-time flyers may find a lot to like about the French model, which beats the Mavic Air in raw camera power, but can be a bit more rough around the edges. We've laid out all of the details you'll ever need to decide whether the Parrot Anafi is the right fit for your next drone purchase. When the Parrot Anafi launched on July 1 for $699 / £649, it sent a message to DJI drone owners: we’ll match or trump the specs you’re used to, for a lower price. For reference, Anafi’s closest foldable competitor, the Mavic Air, retails for $799 / £769 / AU$1,299. For that price, you get the drone, a Skycontroller 3 RC, one battery, a carrying case, one 16GB microSD card and a microSD adapter, eight spare propeller blades, a USB-A to USB-C charging cable, and a mounting tool. The Parrot Anafi should be available from most major retailers, along with Parrot’s site. On Parrot’s site, you can also order spare batteries at $99 / £89 apiece or another eight backup propellers at $20 / £18 per box. As you’ll read below, we think investing in both is a near necessity, which makes it unfortunate that Parrot doesn’t offer some kind of discounted bundle with more accessories. Parrot also nickel-and-dimes you somewhat with its premium app features. Almost every flight and camera feature is unlocked by default, but two flight modes – Follow Me and Flight Plan – cost $17.99 each in the Freeflight 6 app in the US. If any drone needs flaming decals or a paint job to give it personality, it’s probably the Anafi, which you can best describe with the word “functional”. Unlike Parrot’s tiny killer-robot look with the Mambo FPV drone, or the Bebop 2’s more traditional look with a curved frame and black/white contrast, the Anafi’s one-color, plasticy look arguably doesn’t have as much personality or polish. 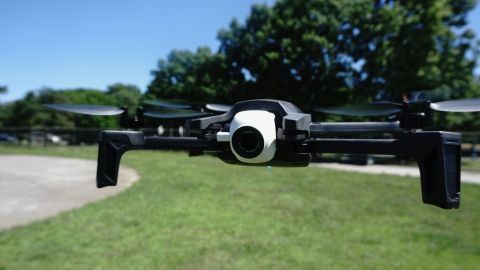 What saves it in our eyes is the arthropod-inspired frame and maneuverable eyeball camera at its head, which could be a game-changer for drone photography and videography. Unattached from the drone’s frame, it has 180 degrees of vertical range: it can take shots directly upwards, which no other drone can do. The camera also has a 2.8x zoomable lens with no image quality reduction, another exciting innovation that we’re certain other dronemakers will copy for future models. Because Anafi has no obstacle avoidance sensors except for a landing sensor on the bottom, it’s a relief that you can take photos without having to get too close to your subject. Now that we have these perks, we don’t want to go back to the rigid, static cameras of our other drones. Back to the design. While most foldable drone arms fold inward on top of one another, Anafi folds outward, making it taller but narrower than most competitors. Specifically, it measures at 9.6 x 2.6 x 2.5 in (244 x 66 x 63.5 mm) – about the size and shape of a tall smart speaker or water bottle. While it definitely won’t fit in your pocket, it won’t weigh down your backpack or purse overly at 320g (0.7 lbs / 11.3 oz). Its lightweight frame makes Anafi more susceptible to winds and random drifting than most other drones, but it also helps it to survive crashes that more densely-packed DJI drones might not (see the Performance and control section for more). Just underneath the “Parrot” logo on the back is the removable 2,700mAh lithium-ion battery. Very easy to remove or clip back on, it helps for a quick swap with a backup. Underneath the battery lies the microSD card, which you can also swap out quickly; regrettably, there’s no built-in SD storage. On the whole, Anafi underwhelms a bit in exterior appearance, but we’re impressed by the tricks up its foldable sleeves. And, if you won’t impress your friends with the drone itself, you will impress them with the high-quality shots you get during your long flights. Drone veterans sometimes brag on DJI message boards about turning off their drones’ OAS (Obstacle Avoidance System) for true drone freedom. But, for drone novices or younger flyers, the lack of automated avoidance options on the Anafi may be a deal-breaker. Put bluntly, Anafi is blind as a bat. It won’t notice anything around it until you crash into it. Even its bottom sensor, which has no trouble registering the ground during landings, didn’t react to my hand when I waved it underneath the hovering drone for five seconds. The comparison to the Mavic Air’s seven-camera vision system and three-direction environmental sensing isn’t flattering. Anafi also tends to drift in different directions for no apparent reason. I conducted a hover test in the middle of my apartment living room to check the battery life; while I was distracted, it would drift upwards or sideways one or two feet without any controller input or wind, coming close to crashing into the ceiling light and my bookcase a couple of times before I stopped it. Most people won’t be silly enough to fly a drone in an enclosed space. But, the drone’s penchant for seeking trouble continued once I got outdoors. When I tried to get a close-up photo of the drone in flight, it would arbitrarily start to drift towards me, so that I had to back up. While testing to see how close I could get my Anafi to a fence, it drifted forward, sans controller input, and crashed into it. Plus, Parrot’s automated cinematic modes, which make your drone sweep dramatically upwards or circle around you, for example, can easily make your drone crash into a wall or tree if you’re not careful. But, once we stopped flirting with danger and took to the open skies, the Anafi flew fast and true. There’s a tiny bit of lag between moving the joystick on the controller and the drone actually moving, but you get used to the gap after just a few minutes of flying. You have full control over the settings of your drone, including how fast Anafi turns on each axis, how quickly the camera tilts or zooms, and max speed. Anafi can hit 33 mph / 55 kph at full power, which is comparable to most non-competitive drones. We had a blast just flitting around obstacles and having Anafi spin around at tight angles. One thing we couldn’t test was max transmission range – New York City has very strict rules about where you can fly your drone and how high it can go. Parrot claims you can hit up to 2.5 miles, but all we can guarantee is that we had no connectivity problems while it was in line of sight. But, we can guarantee that Anafi is much less likely to infuriate your neighbors than your DJI drone. The rotor fan noise, which ironically sounds a bit like a small swarm of insects, doesn’t seem to carry more than a hundred yards away or so. After the flight test, we asked picnickers around the model airfield how noisy they would say the drone was on a 1-10 scale; all of them said they hadn’t heard anything at all, though it’s possible they were just being polite.